Who Killed the Americans in Karbala? 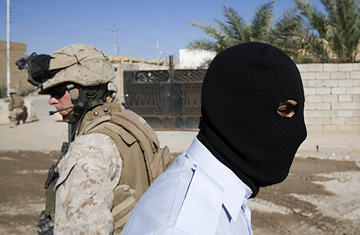 A U.S. Marine and Iraqi policeman in Iraq. January's attack on U.S. forces at the Iraqi government complex in Karbala has become a kind of epic unsolved mystery among troops at Forward Operating Base Iskan, where soldiers from the unit involved are based. There is no shortage of theories among the roughly 30 troops who were there as to whom was responsible for the attack. Many soldiers believe the attackers, who appeared wearing U.S. military uniforms and speaking English, were Iranian operatives from the notorious Quds Force. Some think the assault party that entered the complex in a convoy of SUVs was a rogue cell of the Mahdi Army. Still others suspect the hit team was a kind of all-star insurgent squad, with skilled fighters from the Mahdi Army, Iran and the Badr Brigade, another Shi'ite militia. While much has been said about the attackers who stormed the compound from the outside, little has been revealed about the possible involvement of Iraqi Police who were inside at the time. But the final report of the official military investigation into the incident says there is some evidence to suggest that Iraqi Police who'd been working with U.S. forces in Karbala for over a year helped orchestrate the attack. "There are indicators that information was exchanged between the attackers and the Iraqi Police [IP] prior to this attack," says the report, a copy of which was obtained by TIME. "Senior IP leadership at the station knew the coalition battle drills, and often watched them practice. The attackers knew exactly where to find the officers and which rooms were occupied by the Americans. The back IP gate was left unlocked and unmanned, and the Iraqi vendor and civilian workers absented themselves just prior to the attack." What's commonly understood about the attack is that a crack team of gunmen sneaked into the Karbala police station, where about 30 U.S. soldiers were normally at work on training programs and other initiatives aimed at building up local security forces. The attackers, who carried U.S.-style weapons, killed one American soldier after getting into the compound and then abducted four others, executing them a short distance away as the attackers fled, evading capture by abandoning their vehicles and shedding their bogus American uniforms and mock weapons. Findings of the investigation suggest that at least some of the Iraqi Police the Americans were training ultimately turned on them prior to the attack and perhaps cooperated in it. And many of the soldiers who were there definitely feel betrayed by Iraqi Police they had grown to trust to some degree. U.S. troops who fought the attackers Jan. 20 say many of the Iraqi Police on hand did nothing to help them during the fight and seemed indifferent afterward. None of the Iraqi security forces on hand sustained any injuries, according to the report. The attackers fired only on the Americans. "No one was shot," says Sgt. Michael King, describing the Iraqi Police immediately after the attack. "No one twisted an ankle. No one jammed a thumb. Nothing." The investigation report adds that one senior Iraqi Police official even seemed happy after the attack as he talked into a cell phone and walked among the wreckage of the aftermath laughing. The military has shown its report to the families of the soldiers killed in the attack but not released the findings publicly. Military officials say they are still at work trying to kill or capture figures thought to have had a role in the attack party that came from the outside. But so far there have been no arrests of Iraqi Police suspected of involvement.